Because PCD is present in about a quarter of situs inversus totalis patients and due to the fact that situs inversus totalis is present in nearly half of individuals with PCD, this article covers both heterotaxy syndrome and PCD. Moreover, because asplenia and polysplenia can occur in the same family, [5, 6] a patient’s splenic phenotype should be viewed as merely one phenotypic aspect of an underlying laterality disorder, even though many prior reviews of heterotaxy syndrome have divided patients into two groups based on only splenic phenotype. The absence of outer dynein arms in the spermatozoa and airway cilia of humans with the Kartagener triad (ie, situs inversus totalis, sinusitis, and bronchiectasis) was also noted by Björn Afzelius (see the image below). The structure and function of cilia is shown here. (A) Most motile cilia are organized with 9 microtubule doublets surrounding a core pair of doublets (9+2 configuration). Outer dynein arms (green) and inner dynein arms (blue) are shown. Cilia on the cells of the ventral node in the normal mouse embryo have no core doublet (a 9+0 configuration) and were initially thought to be nonmotile; however, upon closer scrutiny, node cilia were seen to have a rotatory motion (600 rpm). [Figure A is from Hirokawa N, Tanaka Y, Okada Y. Left-right determination: involvement of molecular motor KIF3, cilia, and nodal flow. Cold Spring Harb Perspect Biol. Jul 2009;1(1):a000802 and is reprinted with permission of Cold Spring Harbor Press.] (B) lrd (left-right dynein), the protein (green) mutated by the iv mutation, is also known as DNAH11, DNAHC11, and DLP11. [Figure B is from the United States Department of Energy Genomes to Life Program.] 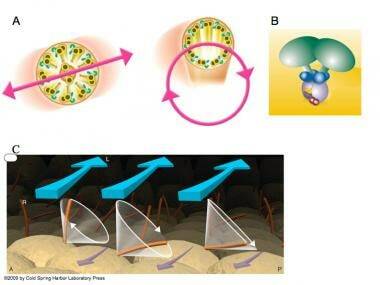 (C) The rotatory cone of each cilium is tilted posteriorly. Hence, the cilia make a leftward swing at the fluid surface and a rightward swing at the cellular surface. Because more viscous drag is present at the cellular surface, the rightward sweep is less effective at generating fluid movement than is the leftward sweep. [Figure C is from Hirokawa N, Tanaka Y, Okada Y, Takeda S. Nodal flow and the generation of left-right asymmetry. Cell 2006; 125:33-45 and is reproduced with permission from Cell Press.] A = anterior; L = left; P = posterior; r = Right. When the iv mouse mutation was cloned, it was found to encode a molecular motor protein, an axonemal dynein, and was named lrd, for left-right dynein (human homolog is DNAH11/DNAHC11, Dynein heavy chain 11, axonemal). However, its expression at embryonic day 7.5 was confined to the few hundred ciliated cells of the ventral surface of the node, a fluid-covered, pit-shaped structure at the anterior end of the primitive streak. Because these cilia, 5 microns in length and 0.3 microns in diameter, are missing the central doublet (i.e., have a 9+0 configuration of microtubule doublets, rather than the 9+2 configuration typically seen in motile cilia), they were not believed to be motile. Although the node was known to have important roles in organizing the body plan of the mouse embryo, the function of lrd remained mysterious. The next year, the phenotype of mice missing the kinesin Kif3b was reported. Kif3b is a molecular motor which, like dynein, is responsible for transport along microtubules within cilia; kinesins transport their cargo toward the "plus end" of the microtubule, whereas dyneins are "minus end directed motors." Fifty percent of the 9.5-day embryos had L-looped hearts. Closer scrutiny of the cilia on normal ventral node cells showed that they do in fact move, despite their 9+0 arrangement of microtubules. In fact, uniquely among cilia, they rotate at 600 rpm. Ventral node cells of Kif3b nulls had either sporadic, very short cilia or absent cilia. Whereas iv heterozygotes had cilia that rotated at 600 rpm, iv homozygotes had immotile cilia. In the zebrafish (Danio rerio), rotatory cilia-bearing structures homologous to the mouse node have been identified; however, they do not appear to be present in chicks or pigs,  which both appear to have short, nonmotile cilia  and may utilize an alternative left-right specification strategy at the embryonic node. Moreover, the African clawed frog (Xenopus laevis) specifies the embryonic left-right axis long before cilia can be identified. Numerous steps in the process of embryonic development that precede the development of node cilia remain unknown. In fact, three temporal phases in which molecular and cellular decisions determine the left-right axis of the body plan are likely (ie, pregastrulation, gastrulation, and organogenesis), as is shown in the image below. Three phases of elaboration of left-right (LR) asymmetry are shown. The first step consists of differentiating the left and right sides on the cellular level. This probably takes place by means of a chiral molecule. (A) A subset of the cells (yellow) of the fairly early embryo undergo this process. 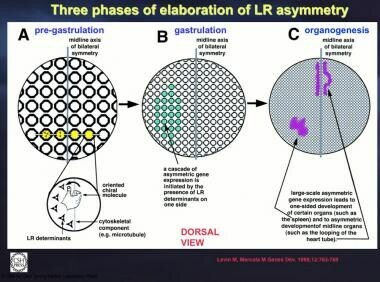 (B) Localized cellular asymmetry is propagated between cells to cause LR determinants to accumulate on one side of the embryonic midline, possibly by a process involving transport through gap junctions. These determinants would then induce cascades of factors in multicellular fields of the embryo. (C) Finally, the asymmetric presence of these factors induces or suppresses asymmetrically located organs such as the spleen and regulates asymmetric morphogenesis of other organs such as the heart tube. Courtesy of Levin M, Mercola M. The compulsion of chirality: toward an understanding of left-right asymmetry. Genes Dev. Mar 15 1998;12(6):763-9. In addition, the underlying cellular biology of why improper left-right specification of the lateral plate mesoderm has such a profound effect on the patterning of the heart, particularly the venous inflow and arterial outflow, has yet to be understood. The bronchial branching pattern (and lung lobation) can be normal, inversus, right isomeric, or left isomeric. Liver lobation can be normal, inversus, or symmetric. In the gallbladder and biliary tree, hypoplasia, absence, and duplication can be noted. The spleen can be normal, absent, hypoplastic, or multiple. The intestine can develop malrotation. The hepatic segment of inferior vena cava (IVC) can be present or absent (the so-called “interrupted IVC"). The hepatic veins can be normal (ie, join the IVC just proximal to the IVC-atrial junction) or can connect independently to the atria. The coronary sinus can be normal, absent, or completely unroofed. The superior vena cava (SVC) can be normal (unilateral) or bilateral. Pulmonary veins can be partially anomalous or totally anomalous. Appendage morphology can be normal, inversus, right isomeric, or left isomeric. The common atrioventricular canal (CAVC) is usually significantly malaligned toward the morphologic right ventricle (RV), but it can be malaligned toward the morphologic left ventricle (LV). The ventricles can be D-loop or L-loop (superoinferior ventricles is rare). In the outflow tract, subpulmonary stenosis or atresia is usually noted, but subaortic stenosis can be observed. Double-outlet RV is most common, but tetralogy of Fallot can occur. Transposition of the great arteries can occur. Either a left aortic arch with a left upper descending aorta or a right aortic arch with a right upper descending aorta can occur. Double aortic arch is exceedingly rare. In cases of left aortic arch with left upper descending aorta, the abdominal aorta is left of the spine. In cases of right aortic arch with right upper descending aorta, the abdominal aorta is right of the spine (unlike the situation without heterotaxy, in which the abdominal aorta is left of the spine). Many cases have both the abdominal aorta and the IVC (or azygos, if the hepatic IVC is absent) on the same side of the spine (unlike without heterotaxy, in which the IVC is right of the spine, whereas the abdominal aorta is left of the spine). Although the genetic underpinnings of left-right patterning of the embryonic brain and spinal cord have been studied extensively in some vertebrate systems, relatively little is known about this in humans so far. Genes required for proper left-right asymmetry are shown. Genes are presented in five columns, according to the developmental phase in which they are currently thought to function. The leftmost column has the earliest functioning genes. The second column has genes required for the development of the node (or its equivalent). 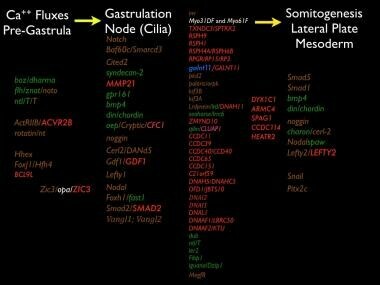 The third and fourth column have genes that are required for normal node cilia function. Genes in white, green, or blue denote those in which the proof came from studies of fruit fly (Drosophila melanogaster), zebrafish (Danio rerio), or frog (Xenopus laevis), respectively. Genes in brown are those studied in mice (Mus musculus), whereas those discovered in humans (Homo sapiens) are shown in red. The true prevalence of heterotaxy syndrome is unknown, because many patients, especially those with left atrial appendage isomerism or polysplenia, have sufficiently mild heart disease such that the underlying diagnosis of heterotaxy may not even be considered by the clinician. Although no predilection based on race has been identified, two studies noted a male-to-female ratio of 2:1. The age at presentation is largely dependen on the severity of the heart disease. The vast majority of patients with heterotaxy syndrome who have cardiovascular phenotypes significant enough to warrant cardiac surgical palliation undergo staged reconstruction to create Fontan-type circulatory arrangements; all of these patients can be expected to need cardiac transplantation in the second or third decades of life. Whether patients with heterotaxy syndrome who have cardiovascular defects that can be managed without the Fontan procedure fare worse than comparable patients without heterotaxy is currently unknown. In a retrospective, single-center study (1997-2014) of 35 children with heterotaxy syndrome, the reported survival was 83% over a median follow-up of 65 months. Of the 12 patients with poor outcomes (34.3%), 6 died, 1 underwent cardiac transplantation, and 5 had a New York Heart Association heart failure classification above III. Kartagener M. [Zur pathogenese der bronchiektasien: bronchiektasien bei situs viscerum inversus] [German]. Beitr Klin Tuberk. 1933. 83:489-501. Martin G. [Observation d'une deviation organique de l'estomac, d'une anomalie dans la situation et dans le configuration du coeur et des vaisseaux qui en partent ou qui s'y rendant] [French]. Bull Soc Anat Paris. 1826. 1:40-8. Kennedy MP, Omran H, Leigh MW, et al. Congenital heart disease and other heterotaxic defects in a large cohort of patients with primary ciliary dyskinesia. Circulation. 2007 Jun 5. 115 (22):2814-21. [Medline]. Shapiro AJ, Davis SD, Ferkol T, et al. Laterality defects other than situs inversus totalis in primary ciliary dyskinesia: insights into situs ambiguus and heterotaxy. Chest. 2014 Nov. 146 (5):1176-86. [Medline]. Polhemus DW, Schafer WB. Congenital absence of the spleen: syndrome with atrioventricularis and situs inversus: case reports and review of the literature. Pediatrics. 1952 Jun. 9 (6):696-708. [Medline]. Zlotogora J, Elian E. Asplenia and polysplenia syndromes with abnormalities of lateralisation in a sibship. J Med Genet. 1981 Aug. 18 (4):301-2. [Medline]. Ivemark BI. Implications of agenesis of the spleen on the pathogenesis of conotruncus anomalies in childhood; an analysis of the heart malformations in the splenic agenesis syndrome, with fourteen new cases. Acta Paediatr Suppl. 1955 Nov. 44 (suppl 104):7-110. [Medline]. Hummel K, Chapman D. Visceral inversion and associated anomalies in the mouse. J Hered. 1959. 50:9-13. Layton WM Jr. Random determination of a developmental process: reversal of normal visceral asymmetry in the mouse. J Hered. 1976 Nov-Dec. 67 (6):336-8. [Medline]. Icardo JM, Sanchez de Vega MJ. Spectrum of heart malformations in mice with situs solitus, situs inversus, and associated visceral heterotaxy. Circulation. 1991 Dec. 84 (6):2547-58. [Medline]. Seo JW, Brown NA, Ho SY, Anderson RH. Abnormal laterality and congenital cardiac anomalies. Relations of visceral and cardiac morphologies in the iv/iv mouse. Circulation. 1992 Aug. 86 (2):642-50. [Medline]. Nonaka S, Tanaka Y, Okada Y, et al. Randomization of left-right asymmetry due to loss of nodal cilia generating leftward flow of extraembryonic fluid in mice lacking KIF3B motor protein. Cell. 1998 Dec 11. 95 (6):829-37. [Medline]. Hirokawa N, Tanaka Y, Okada Y. Left-right determination: involvement of molecular motor KIF3, cilia, and nodal flow. Cold Spring Harb Perspect Biol. 2009 Jul. 1 (1):a000802. [Medline]. [Full Text]. Soukup V, Yong LW, Lu TM, Huang SW, Kozmik Z, Yu JK. The nodal signaling pathway controls left-right asymmetric development in amphioxus. Evodevo. 2015. 6:5. [Medline]. Delling M, Indzhykulian AA, Liu X, et al. Primary cilia are not calcium-responsive mechanosensors. Nature. 2016 Mar 31. 531 (7596):656-60. [Medline]. Gros J, Feistel K, Viebahn C, Blum M, Tabin CJ. Cell movements at Hensen's node establish left/right asymmetric gene expression in the chick. Science. 2009 May 15. 324 (5929):941-4. [Medline]. Stephen LA, Johnson EJ, Davis GM, et al. The chicken left right organizer has nonmotile cilia which are lost in a stage-dependent manner in the talpid(3) ciliopathy. Genesis. 2014 Jun. 52 (6):600-13. [Medline]. Guimier A, Gabriel GC, Bajolle F, et al. MMP21 is mutated in human heterotaxy and is required for normal left-right asymmetry in vertebrates. Nat Genet. 2015 Nov. 47 (11):1260-3. [Medline]. Bartoloni L, Blouin JL, Pan Y, et al. Mutations in the DNAH11 (axonemal heavy chain dynein type 11) gene cause one form of situs inversus totalis and most likely primary ciliary dyskinesia. Proc Natl Acad Sci U S A. 2002 Aug 6. 99 (16):10282-6. [Medline]. Kosaki K, Bassi MT, Kosaki R, et al. Characterization and mutation analysis of human LEFTY A and LEFTY B, homologues of murine genes implicated in left-right axis development. Am J Hum Genet. 1999 Mar. 64 (3):712-21. [Medline]. Bamford RN, Roessler E, Burdine RD, et al. Loss-of-function mutations in the EGF-CFC gene CFC1 are associated with human left-right laterality defects. Nat Genet. 2000 Nov. 26 (3):365-9. [Medline]. Hornef N, Olbrich H, Horvath J, et al. DNAH5 mutations are a common cause of primary ciliary dyskinesia with outer dynein arm defects. Am J Respir Crit Care Med. 2006 Jul 15. 174 (2):120-6. [Medline]. [Full Text]. Tan SY, Rosenthal J, Zhao XQ, et al. Heterotaxy and complex structural heart defects in a mutant mouse model of primary ciliary dyskinesia. J Clin Invest. 2007 Dec. 117 (12):3742-52. [Medline]. Karkera JD, Lee JS, Roessler E, et al. Loss-of-function mutations in growth differentiation factor-1 (GDF1) are associated with congenital heart defects in humans. Am J Hum Genet. 2007 Nov. 81 (5):987-94. [Medline]. Pennarun G, Escudier E, Chapelin C, et al. Loss-of-function mutations in a human gene related to Chlamydomonas reinhardtii dynein IC78 result in primary ciliary dyskinesia. Am J Hum Genet. 1999 Dec. 65 (6):1508-19. [Medline]. Ware SM, Peng J, Zhu L, et al. Identification and functional analysis of ZIC3 mutations in heterotaxy and related congenital heart defects. Am J Hum Genet. 2004 Jan. 74 (1):93-105. [Medline]. Mohapatra B, Casey B, Li H, et al. Identification and functional characterization of NODAL rare variants in heterotaxy and isolated cardiovascular malformations. Hum Mol Genet. 2009 Mar 1. 18 (5):861-71. [Medline]. [Full Text]. Roessler E, Ouspenskaia MV, Karkera JD, et al. Reduced NODAL signaling strength via mutation of several pathway members including FOXH1 is linked to human heart defects and holoprosencephaly. Am J Hum Genet. 2008 Jul. 83 (1):18-29. [Medline]. [Full Text]. Kosaki R, Gebbia M, Kosaki K, et al. Left-right axis malformations associated with mutations in ACVR2B, the gene for human activin receptor type IIB. Am J Med Genet. 1999 Jan 1. 82 (1):70-6. [Medline]. Nakhleh N, Francis R, Giese RA, et al. High prevalence of respiratory ciliary dysfunction in congenital heart disease patients with heterotaxy. Circulation. 2012 May 8. 125 (18):2232-42. [Medline]. Zariwala MA, Omran H, Ferkol TW. The emerging genetics of primary ciliary dyskinesia. Proc Am Thorac Soc. 2011 Sep. 8 (5):430-3. [Medline]. [Full Text]. Merveille AC, Davis EE, Becker-Heck A, et al. CCDC39 is required for assembly of inner dynein arms and the dynein regulatory complex and for normal ciliary motility in humans and dogs. Nat Genet. 2011 Jan. 43 (1):72-8. [Medline]. Becker-Heck A, Zohn IE, Okabe N, et al. The coiled-coil domain containing protein CCDC40 is essential for motile cilia function and left-right axis formation. Nat Genet. 2011 Jan. 43 (1):79-84. [Medline]. [Full Text]. Norris DP, Grimes DT. Mouse models of ciliopathies: the state of the art. Dis Model Mech. 2012 May. 5 (3):299-312. [Medline]. [Full Text]. Saunders CJ, Miller NA, Soden SE, et al. Rapid whole-genome sequencing for genetic disease diagnosis in neonatal intensive care units. Sci Transl Med. 2012 Oct 3. 4 (154):154ra135. [Medline]. Boskovski MT, Yuan S, Pedersen NB, et al. The heterotaxy gene GALNT11 glycosylates Notch to orchestrate cilia type and laterality. Nature. 2013 Dec 19. 504 (7480):456-9. [Medline]. [Full Text]. Zariwala MA, Gee HY, Kurkowiak M, et al. ZMYND10 is mutated in primary ciliary dyskinesia and interacts with LRRC6. Am J Hum Genet. 2013 Aug 8. 93 (2):336-45. [Medline]. [Full Text]. Tarkar A, Loges NT, Slagle CE, et al. DYX1C1 is required for axonemal dynein assembly and ciliary motility. Nat Genet. 2013 Sep. 45 (9):995-1003. [Medline]. Hjeij R, Lindstrand A, Francis R, et al. ARMC4 mutations cause primary ciliary dyskinesia with randomization of left/right body asymmetry. Am J Hum Genet. 2013 Aug 8. 93 (2):357-67. [Medline]. [Full Text]. Daniels ML, Leigh MW, Davis SD, et al. Founder mutation in RSPH4A identified in patients of Hispanic descent with primary ciliary dyskinesia. Hum Mutat. 2013 Oct. 34 (10):1352-6. [Medline]. [Full Text]. Knowles MR, Ostrowski LE, Loges NT, et al. Mutations in SPAG1 cause primary ciliary dyskinesia associated with defective outer and inner dynein arms. Am J Hum Genet. 2013 Oct 3. 93 (4):711-20. [Medline]. [Full Text]. Knowles MR, Leigh MW, Ostrowski LE, et al, for the Genetic Disorders of Mucociliary Clearance Consortium. Exome sequencing identifies mutations in CCDC114 as a cause of primary ciliary dyskinesia. Am J Hum Genet. 2013 Jan 10. 92 (1):99-106. [Medline]. [Full Text]. Horani A, Druley TE, Zariwala MA, et al. Whole-exome capture and sequencing identifies HEATR2 mutation as a cause of primary ciliary dyskinesia. Am J Hum Genet. 2012 Oct 5. 91 (4):685-93. [Medline]. [Full Text]. Lin AE, Ticho BS, Houde K, Westgate MN, Holmes LB. Heterotaxy: associated conditions and hospital-based prevalence in newborns. Genet Med. 2000 May-Jun. 2 (3):157-72. [Medline]. Ferencz C, Loffredo CA, Correa-Villasenor A, Wilson PD, eds. Defects of Laterality and Looping. Armonk, NY: Futura Publishing; 1997. McGovern E, Kelleher E, Potts JE, et al. Predictors of poor outcome among children with heterotaxy syndrome: a retrospective review. Open Heart. 2016. 3 (2):e000328. [Medline]. Harden B, Tian X, Giese R, et al. Increased postoperative respiratory complications in heterotaxy congenital heart disease patients with respiratory ciliary dysfunction. J Thorac Cardiovasc Surg. 2014 Apr. 147 (4):1291-8.e2. [Medline]. Prendiville TW, Barton LL, Thompson WR, Fink DL, Holmes KW. Heterotaxy syndrome: defining contemporary disease trends. Pediatr Cardiol. 2010 Oct. 31 (7):1052-8. [Medline]. Loomba RS, Geddes GC, Basel D, Benson DW, et al. Bacteremia in patients with heterotaxy: a review and implications for management. Congenit Heart Dis. 2016 Dec. 11 (6):537-47. [Medline]. Loomba RS, Geddes G, Shillingford AJ, Hehir DA. Practice variability in management of infectious issues in heterotaxy: A survey of pediatric cardiologists. Congenit Heart Dis. 2017 Feb 15. [Medline]. Loomba RS, Danduran M, Nielsen KG, Ring AM, Kovach J, Anderson RH. Cardiopulmonary exercise testing in Fontan patients with and without isomerism (heterotaxy) as compared to patients with primary ciliary dyskinesia and subjects with structurally normal hearts. Pediatr Cardiol. 2017 Feb. 38 (2):410-7. [Medline]. Serraf A, Bensari N, Houyel L, et al. Surgical management of congenital heart defects associated with heterotaxy syndrome. Eur J Cardiothorac Surg. 2010 Dec. 38 (6):721-7. [Medline]. Williams GD, Feng A. Heterotaxy syndrome: implications for anesthesia management. J Cardiothorac Vasc Anesth. 2010 Oct. 24 (5):834-44. [Medline]. Axial magnetic resonance image (MRI) of a case of heterotaxy with polysplenia. (A) The abdominal aorta (abd ao) is on the left side of the spine (S), as is the left-sided azygos (L Azy). Two right-sided spleens (spl) are visible. LHV = left hepatic vein; RHV = right hepatic vein. (B) A common atrioventricular valve (black unlabelled arrows) is markedly malaligned to the right ventricle (RV). A diminutive left atrium (LA) is represented by only an appendage. The patient had an extracardiac conduit (EC) type of Fontan operation. No fenestration is noted between the EC and the neo-left atrium (neoLA). (C) Because this patient had subaortic stenosis, a proximal pulmonary artery-to-ascending aortic anastomosis was performed early in life, along with augmentation of the aortic arch. The L Azy connects to the left superior vena cava (LSVC). LU DAo = left upper descending aorta; Prox = proximal. (D) The LSVC connected originally to the coronary sinus (CS) and then to the right atrium. Despite the fact that the LSVC has been disconnected from the heart and anastomosed end-to-side to the left pulmonary artery, the CS remains large. The narrowed left ventricular outflow tract (LVOT) is seen. Ao = aorta; PA = pulmonary root; RLL PV = right lower lobe pulmonary vein. (E) Because this patient had absence of the hepatic segment of the inferior vena cava, the left-sided SVC-to-left pulmonary artery (LPA) anastomosis is referred to a left-sided Kawashima (LK). The anastomosis of the right superior vena cava to the right pulmonary artery is a right-sided bidirectional Glenn (R BDG) shunt. (F) The left lower lobe pulmonary vein (LLL PV), as part of this patient's totally anomalous pulmonary venous connection, connects to the original right atrium, which is now the neoLA. Coronal magnetic resonance image (MRI) of the same patient as shown in the previous image. (A) Both superior vena cava (SVC)–to–pulmonary artery (PA) anastomoses can be seen. LCCA = left common carotid artery. (B) Three-dimensional surface rendering. RIA = right innominate artery. (C) Three-dimensional reconstruction of only the systemic venous pathway. Malrotation of the gut. This upper gastrointestinal (GI) barium study of the same heterotaxy patient as shown in the previous two images shows a right-sided stomach (St), opposite of the normal site. The duodenum heads to the left, the duodenal-jejunal junction is to the left of the spine (opposite to what would be expected for situs inversus totalis), and the jejunum (J) stays left-sided.